It was just one of the bazillion memes and images to come streaming across my social-media consciousness yesterday, but it stuck with me. It was an ersatz quote from "Lao Tzu," which you can read at your leisure right there where I put it so's ya could. It's not Lao Tzu, of course, which was the first thing that caught my attention when I read it. It does not sound like him, not at all, not if you've ever read the Tao Te Ching. Pesky, pesky religious studies degrees. They just take the fun out of everything. This little nugget of pop wisdom can't be found anywhere in the writings of Lao Tzu, unless by "the writings of Lao Tzu" you mean "quotes I remember from that turtle-dude in Kung Fu Panda." What struck me most about it, though, was not that it was wrong. It was that it was wrong. I should probably unpack that a bit. That it's not Lao Tzu is just one bit of wrongness, you know, the empirical, factual sort. There are other ways to be wrong. Not the principle, mind you. Being present, and being "mindful," these are good things. And the point about not ruminating and not fretting? Sure, it's pop wisdom. But there be truth to that thar saying'. 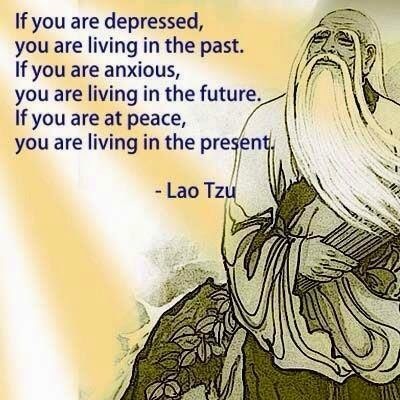 Living in the present is important. The bit of wrongness has to do with two things: reality and tone. Tone first: Look how simple it is to be happy, the tone reads. How easy! Just be present! You know, 'cause it's a gift, or something. Finding the peace of being in the present, though, is hard. Really, really, hard. Hard because it requires intentional development of spiritual disciplines of self-emptying. We are creatures of time and space, who weave our sense of self up from our sense of purpose and the narrative arc of our existence. Stopping that storytelling is hard, as hard as focusing your full attention on the empty space between these two words for an hour. We do this with difficulty. From my own fumbling efforts at mystic self-discipline, I know it to be well worth while, but it's not nearly as bumperstickery as this little quote suggests. The "present," as least as understood as "this moment," is also desperately hard to grasp. What is not past? What is not future? Try to find that, and you can drive yourself mad. Time itself makes this saying almost impossibly difficult, as we can chase the infinitesimal present back to the point were it is as hard to grasp as a singularity. And sure, I'm overthinking it. But that's what we Presbyterians do. Reality second: there are many ways we can be in the present that are not peaceful. The dark shadow of mindfulness is mindlessness, and we succumb to that far more easily. Mindlessness--in the form of rage or terror--silences both the truth of what has been and the possibility that might be. Both are creatures of the moment. The form of being present that transforms is not one that is just about being lost in the "right now." Right mindfulness--similar to what Lao Tzu taught, and of the sort you learn from my Teacher--purposefully opens the present out, to where it embraces both what has past and what is to come. Which, of course, sounds dreadfully obscure and esoteric, and not particularly easy. And it'd make a lousy meme.